Somerset are through to the semi-finals of the Twenty20 Cup after defeating Lancashire in a bowl-out. After the quarter-final at Old Trafford was washed out on three successive days, Somerset won through 5-1 to book a last-four meeting with Kent. Alfonso Thomas twice hit the unguarded stumps for the visitors, with Peter Trego, Charl Willoughby and Ben Phillips also on target. Only rookie paceman Steven Cheetham hit the stumps for the home side. VVS Laxman, Stephen Parry and Mark Chilton all missed with both their deliveries for the Red Rose county. The two sides had hoped to finally play their quarter-final on Thursday after the game was washed out on both Tuesday and Wednesday. 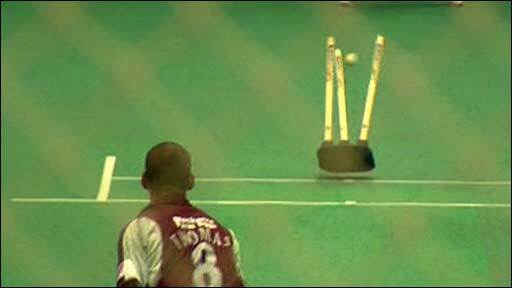 But a thunderstorm and further rain left the ground unplayable, leaving the umpires no alternative but to abandon the match for a third time and order the bowl-out in Lancashire's indoor school. The first bowl-out in Twenty20 cricket came in July 2005, when Surrey beat Warwickshire after the teams finished level under the Duckworth-Lewis method in a rain-affected game.